One huge drawback to converting our lawns in Cumeada into one of these “dry gardens” we read (and hear) so much about is my love of lawn-mowing. I just love using my Viking electric lawn mower, trying to keep the lines made by the roller just so, revelling in the smell of cut grass and the open air. . . . . but I do have to admit that lawns are thirsty beasts. We are fortunate in having access to a borehole of sweet water, and had never even thought about the amount of water our fully irrigated gardens and lawns consumed – until a couple of years ago, when the borehole pump failed, we had guests holidaying in the house, and the Municipal water supply was turned on. 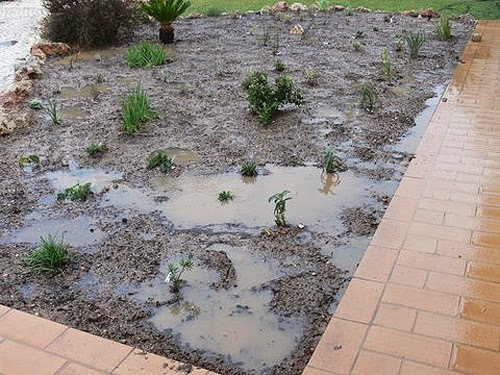 It stayed on for the remainder of the summer, some three months, and when we returned to the Algarve for the winter, we found a Silves Camara water demand for some 4,000 euros waiting for us. My word, shocks like that do tend to concentrate the mind, and I immediately went into dry garden investigation overdrive. We were equally fortunate to discover, through our membership of The Mediterranean Garden Society, a “dry garden” plantsman based in Meze, in Southern France and he, Olivier Filippi, has been the major source of our plantings ever since. The Robert Louis Stevenson quotation “to travel hopefully is a better thing than to arrive” can certainly be applied to garden planning, and many happy hours have been spent poring over books and catalogues, many lists of “must have” plants drawn up – and discarded before the final decisions were made and orders for plants despatched. November 2009 saw the start of re-designing the two north facing gardens at the front of the house which were completely stripped of the water-hungry shrubs which had been planted as part of the overall garden construction when the house was built in 2005 on an east-west ridge between Silves and Messines. 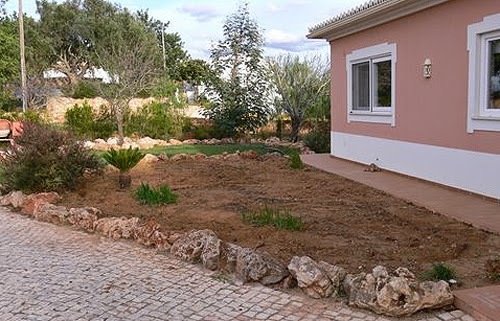 After clearing the ground, removing obstinate roots and irrigation pipes and adding new compost and grit, the newly delivered dry garden plants were placed, studied, replaced and planted . . . . just at the start of one of the wettest winter the Algarve has known ! Once the plants were established (and the soil had dried out), a weed suppressing fabric was placed in position and “X” cuts made for them to grow through. We selected a fine “pea” gravel in a mix of pinks, browns and blacks to cover the fabric and this has proved to be a very successful and pleasing choice. Some fourteen months after planting, the dry garden had exceeded all our hopes for it, but for the first year following that wet planting, Summer 2010, the gardens were watered via a hosepipe once a month, but on only one occasion this year, Summer 2011, have we felt that a brief watering was necessary and this did prove beneficial. 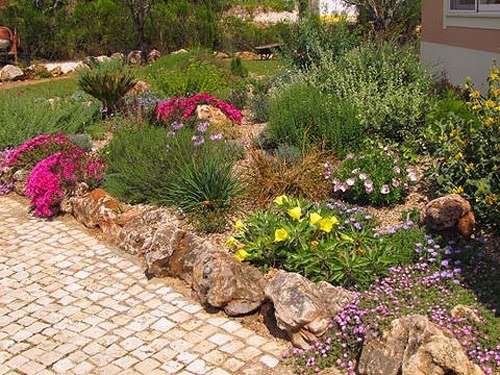 A carefully selected range of plants in a “dry garden” can produce much more colour than in a typical Algarve shrub filled border. The weed suppressing facility of the gravel plus fabric means that weeds grow very sparingly and are easy to uproot once spotted, and time once spent forking out weeds amongst head-high bushes such as Hibiscus and Bougainvillea and now spent on deadheading the low growing shrubs (and taller examples such as Romneya coulteri) can extend the flowering period for most plants by at least a couple of months. I shall miss my therapeutic walks up and down the lawns behind my lawnmower but the pleasure I know we shall derive from a newly planted dry garden will more than compensate and will be well worth waiting for. So, come late October/early November, our front lawns, almost 100m² of fine green turf, will have to go, and will be replaced by a newly designed and landscaped area which, this time next year, with a bit of luck and lots of TLC, should transform the appearance of our home and give the local ladies who promenade through the hamlet something different to look at and talk about ! And the hundreds of gallons of water hitherto wasted on keeping the lawns green will be conserved for other uses. Not a bad result, overall.